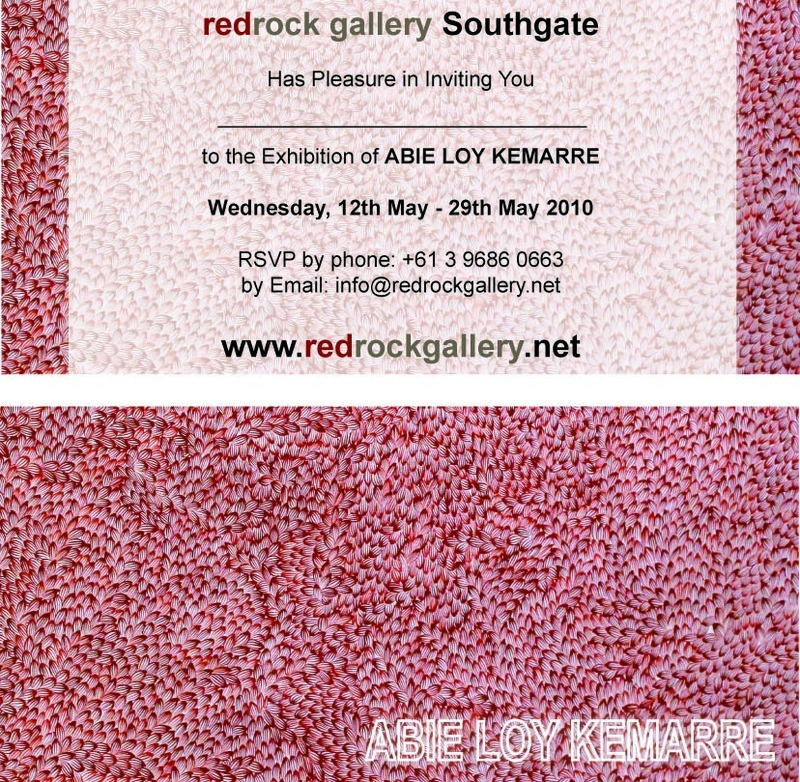 redrock gallery Southgate presents ‘Abie Loy Kemarre Exhibition’ to be held on the 12th of May – 29thMay 2010. The Curator of redrock gallery has direct involvement in commissioning works by some of the most decorated artists in Australian Aboriginal history, including the great Clifford Possum Tjapaltjarri, Kathleen Petyarre, George Tjungurrayi, Minnie Pwerle, Michael Jagamarra, Margaret Turner Petyarre, Ronnie Tjampitjinpa, Pansy Napangardi and Gloria Tammare Petyarre. For more than 17 years Mem Aziz has built an exclusive relation ship with the elders and their families. “Abie is one of those family members with a special talent, her delicate and incredibly intricate brush strokes have never been done before by a traditional Aboriginal artist. Her family legacy of artists has been extraordinarily fine-tuned in a way that I just can’t express in words. Her fine, feathered bush leaves can be hypnotic and perceived as 3D (3 dimensional),” Mr Aziz said. Abie’s depiction of the “Bush Leaf Dreaming”, a Dreaming pioneered by her family heritage, provides viewers with a refreshing and exceptional interpretation of her mythological past. Her Grandmother Kathleen’s guidance played an integral part in nurturing Abie’s unique talents. Her elaborate, contemporary techniques, fused with ancient mythological knowledge, take viewers on a boundless journey through her ancestral history. Abie expresses on canvas an intangible web of fine detail that transforms her inherited ancestral Dreaming into a vividly real kaleidoscope of colour, intricacy and movement never seen before. Abie’s eclectic influences are reflected in the mythology she depicts, but it is the fresh, energetic approach that makes her one of the most collectable emerging artists on the Aboriginal art scene. Quite simply, she captivates and enraptures all who experience her creations. The elaborate and organic approach to her paintings puts Abie Loy Kemarre at the forefront of the Aboriginal contemporary art movement. Abie’s works will be exhibited in redrock gallery for three weeks, from May 12th, 2010. redrock gallery is recognised as one of the finest, most reputable Aboriginal galleries in Australia, presenting some of the most exclusive works in the history of Aboriginal art, together with an inspiring collection of contemporary works from emerging and established artists of the Central and Western desert. Located in the Art precinct of Melbourne, mid-level at the Southgate Arts and Leisure centre overlooking the famous Yarra River, it is a wonderful art space, displaying exciting and imaginative indigenous works.